Through GFA’s Bridge of Hope Program, Selvan, like the boy pictured, has received opportunities never before possible. Selvan stood before the other Bridge of Hope children holding a heavy induction cooker beneath his bright face. His mother was going to love this high-efficiency cook top, a vast improvement over her current cooking method. Scanning the faces before him, he couldn’t believe he had won third prize in the Colors of Hope artwork competition. When Selvan had joined the Bridge of Hope program six years before, he never volunteered to speak and avoided the other children. He was only there because his life had fallen apart—what did he have to be happy about? He was not interested in extra activities, such as sports, art or competitions, provided by Bridge of Hope. Acquainted with tragedy at the tender age of 6, Selvan watched his family fall into darkness after the sudden paralysis and subsequent death of his father. At the time, Selvan’s mother was pregnant with his little sister, and the young widow had no way to support her family. After three years of struggle, hope dawned for Selvan’s family when a Bridge of Hope center opened in their community. Selvan was enrolled, and his mother was hired as a cook for the center—just what she needed to provide for her young children. Despondency was Selvan’s constant companion in those days. He was unmotivated in school and at the center. What was the point of trying, a life beyond disappointment? The staff at Bridge of Hope patiently walked with Selvan through his dark days and encouraged him to hope for restoration. Gradually, Selvan knew joy in life again. He participated in sports and competitions. He made new friends. Slowly, his sadness turned to anticipation. 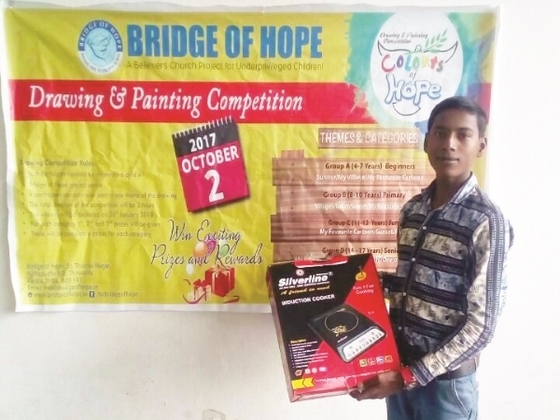 Selvan was preparing to graduate from school when he won third prize in Colors of Hope, Bridge of Hope’s art contest. He proudly showed the crowd his prize and his prize-winning drawing: a carefully sketched scene of Jesus’ birth. His mother watched with joy in her eyes. This young family, whose story began with loss, has grown to hope for good. Bridge of Hope has not only supported Selvan in his education, but also helped the whole family, once in the dark valley of death, to emerge on the other side, where hope reigns.